The situation in Afghanistan is quickly deteriorating. Thousands of civilians, Afghan troops, and NATO troops have lost their lives. The casualty figure in the year 2009 was the highest since the war started 8 years ago. Now, there are 100,000 NATO troops compared to 16,000 troops when the war started, but many Afghans feel that Afghanistan is more insecure and unstable now. The Karzai government has lost control over most of Afghanistan and its authority is limited to Kabul only. However, even Kabul is far from secure. Kabul has come under repeated attacks. The population has swelled up to more than three times because of the refugees coming from all over the country. The authorities are unable to provide the most basic necessities. The Karzai government and the war lords who were really ruling the country are probably the most corrupt regime in the world. The 60 billion dollars aid to Afghanistan has been mostly usurped by this click and very little has trickled down to the people. President Obama has decided to send 30,000 more troops. However, if raising the troops from 16,000 to 100,000 did not help, then how can 30,000 more troops help to control Afghanistan? Many times more troops will be needed to have a realistic chance to control the situation in that country. Even then there is no guarantee that it will do the job. The situation in Afghanistan is not isolated, but is related to the overall situation in the world. The western crisis is not just an economic crisis, but it is a global crisis which affects all aspects of life. The west has lost the spirit to fight. The crisis of western capitalism has thoroughly demoralized people in the western countries. Ultimately, it is not the weapons nor the numbers which win the war, but the human factor, that means the spirit to fight, which decides the outcome of the war. This is the main reason that the west has not been able to win any major war after the Second World War. When we look at Afghanistan, Pakistan, Iraq, Iran, Somalia, and Yemen, then it becomes obvious that the antiWest Islamic fundamentalists are gaining influence. In many Muslim countries, there is a growing trend of antiWest sentiment among the population. In Afghanistan, more and more of the population is getting disillusioned with the west and the pro-western elements in Afghanistan. 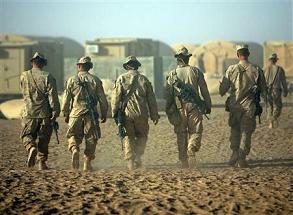 I feel that the outcome of the war in Afghanistan is going to be just like Vietnam. The west is not going to win the war. The Russians had warned the Americans not to get involved in Afghanistan. The Americans did not listen to them. The American experience is not only going to be like the Russian experience, but will be much worse because the Russians were only fighting in Afghanistan, whereas America has to fight in many countries. Iraq, Iran, Pakistan, Somalia, Yemen; each day the list continues to be longer with no end in sight.